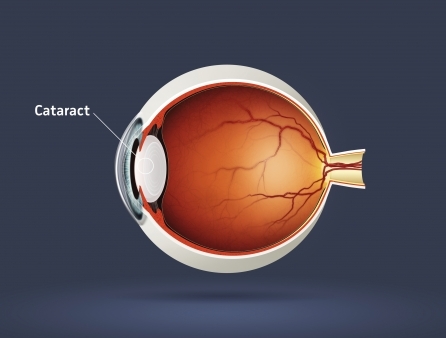 A cataract is a general term that refers to any cloudiness or opacification of the natural lens of the eye. This is most commonly seen as an aging change, but can also be caused by some chronic eye diseases, systemic diseases, medications, trauma, or genetic diseases. Patients most commonly complain of a gradual onset of blurriness or haziness in the vision, sometimes complicated by glare in bright lights (like oncoming headlights). Occasionally cataracts cause symptoms of double vision or rarely cause increased inflammation and pressure in the eyes. A cataract evaluation consists of a complete eye exam to exclude, as best as possible, any other disease process that may be present. Early cataracts can often be treated with glasses or magnifiers alone. However, as cataracts become more advanced, these treatments may not allow patients to perform their daily activities comfortably. Ultimately, cataract surgery may be the best option. Our doctors have performed over 25,000 cases with great success. Patients can typically expect a ten-minute outpatient procedure with no shots, no stitches and no patches post surgery. Toric lenses to correct astigmatism and multifocal lenses to provide crisp distance and near vision are available.